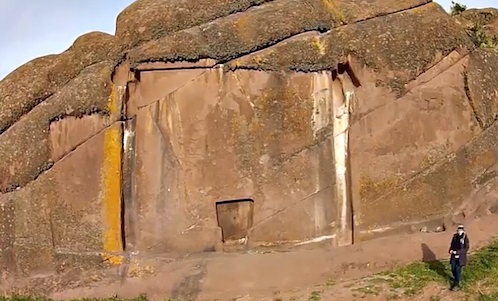 UFO SIGHTINGS DAILY: Megalithic Devil's Doorway In Peru Has Legend Of Being Star-gate For Space Priests, Aug 2015, UFO Sighting News. 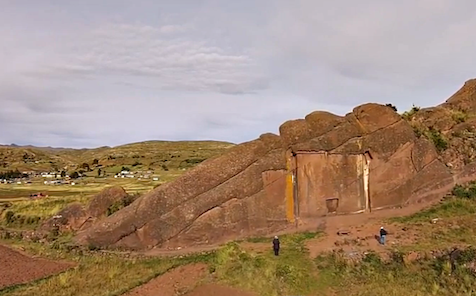 Megalithic Devil's Doorway In Peru Has Legend Of Being Star-gate For Space Priests, Aug 2015, UFO Sighting News. This is something thats got my attention. A door that goes to nowhere and a local legend that says space brothers come and go through it by placing a golden disk at its center to open the door. Doorway to another planet? I think its a doorway to their alien base 3-5km underground. So if the locals know about them, then the aliens must have mingled with the locals. They say they behaved like priests. Much like the W56, who refuse to do harm to anything. This is called Puerta del Hijo Marka or the Gate of the Gods. Its a doorway carved into solid rock. According to David Childress, ” it really appears appears to be a gateway, but it doesn’t really go anywhere”. Its literally in the middle of nowhere, at 14,000 ft, yet this is a perfect rectangle carved out of a solid block of rock and right at the bottom its got another indent in it, that looks like a door. The Peruvians refer to it as the Gate of the Gods. But the baffling question is, why would someone make a doorway, in the middle of nowhere at 14000 ft and one that doesn’t go anywhere? There has to be a way to get across this. According to Inca legend, the first priest Amaro Muro is said to have traveled through this doorway, using a special object to activate it turning the solid rock into what is known as the Star Gate. This Star Gate was activated by help of a golden disc and this golden disc fell from the sky. He held the golden disc into the gateway in a recessed area, and the gateway activated and he passed though it, never to be seen again. Archeologists have noticed a depression at the center of the doorway, and it is believed it was perhaps this depression, where the golden disc was placed. This disc was made of gold and other precious metals, and perhaps was a technological device which had the ability to open up inter-dimensional gateways. Furthermore, according to the local legends, these priests were called space brothers and came from other world. May they have come to earth through this Gateway? However, could a device to activate this door actually exist? And if so, where would the doorway lead? The Gate of the Gods could well be one end of a wormhole, a type of portal used to connect to another part of the universe or another dimension.